As widely rumored, Amir Khan will return to boxing in 2018 under the aegis of Great Britain’s leading promoter, Matchroom Sport. Khan and Matchroom honcho Eddie Hearn officially came to terms on Wednesday, Jan. 10. It’s a three-fight deal that will commence on April 21 in Liverpool when Khan opposes the ubiquitous TBA. No doubt Khan and Hearn will allow speculation to “marinate” before unveiling the opponent. This will be Khan’s first start since May of 2016 when he moved up in weight to challenge WBC world middleweight title-holder Canelo Alvarez on Cinco de Mayo weekend in Las Vegas. It will be his first fight in his native England since April of 2013 when he came off the deck to outpoint Mexico’s Julio Diaz in a 12-round contest at Sheffield. Khan was a big underdog heading into the Canelo fight. The presumption was that the Mexican was too big for him – too big and too powerful. A slick boxer, Khan had a few good moments — no surprise there – and was actually ahead on one of the scorecards heading into the sixth frame. But then Canelo lowered the boom, laying him out flat with an overhand right that landed flush on the chin. Khan was a no-show at the post-fight press conference, having been removed to a hospital for observation. This wasn’t the first time that Khan (31-4, 19 KOs) was betrayed by a soft beard. In 2008, he suffered a shocking first round knockout at the hands of Breidis Prescott. Four years later, he was TKOed by Danny Garcia. The fight was stopped in the fourth round because of the three-knockdown rule. In his other setback, he was on the wrong side of a controversial split decision vs. Lamont Peterson on Peterson’s turf in Washington, DC. A rematch was scuttled when Peterson tested positive for PEDs. Amir Khan came to prominence in 2004 when, at age 17, he won a silver medal at the Athens Olympics. Before leaving the amateur ranks, he avenged two losses to Mario Kindelan, the Cuban who defeated him in the gold medal round. He turned pro the following year and went on to win a world title at 140 pounds which he successfully defended five times. Since losing to Alvarez, Khan, who is of Pakistani descent, has been busy keeping his name in the news. His on-again, off-again relationship with his attractive Brooklyn-born wife Faryal Makhdoom has been great fodder for the tabloids. Makhdoom’s westernized ways horrified Khan’s conservative Muslim parents and each accused the other of infidelity. Khan weighed 155 pounds for his bout with Canelo Alvarez, the stipulated catchweight limit. When he resumes his career in April, it will be as a welterweight. It isn’t known if Freddie Roach will be back in his corner. 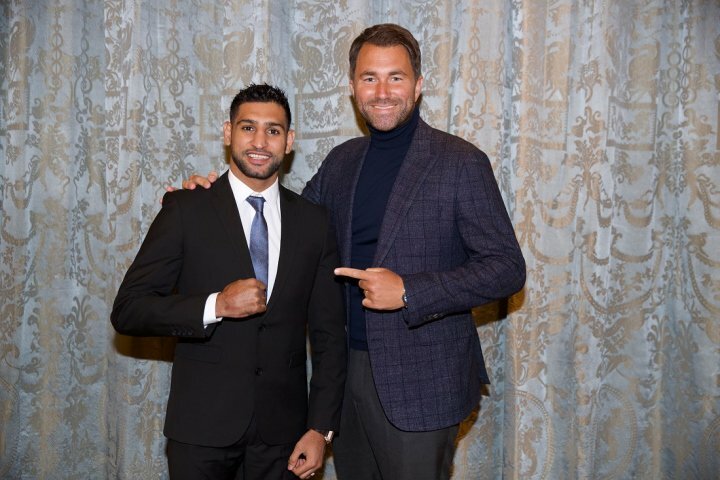 Eddie Hearn threw out several names as potential opponents for Khan’s comeback fight, naming Adrien Broner, Manny Pacquiao, and Kell Brook, among others. Broner seems like the most viable opponent. Aptly nicknamed “The Problem,” Broner too is adept at keeping his name in the news, but for reasons that are organic, not contrived. He has repeatedly exhibited behaviors that are the mark of a knucklehead. Broner poses a risk as he is prone to self-destruct before the bell rings, but if Hearn opts for Broner, he will undoubtedly have a stand-in of good repute at the ready. When Kubrat Pulev was forced to pull out of his Oct. 28 match with Anthony Joshua, Hearn had Carlos Takam waiting in the wings and the transition was seamless. In the meantime, look for Amir Khan to pump up the April 21 event in Liverpool with more fake news stories – stories that have nothing to do with his skillfulness as a boxer.